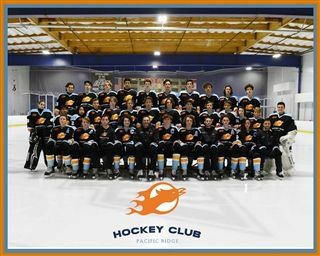 The Pacific Ridge Hockey Club (currently ranked first in California by Power Rankings!) traveled to Anaheim this past weekend to compete in league play. At present time the varsity club is in sole possession of first place in Division II and the weekend's game was another solid example of the firepower and youth of the team. Sophomore Luke Stengler recorded his first hat trick (3 goals) to lead the Birds to a 6-0 victory over the Knights from Las Vegas. Senior goalie Patrick O’Donnell continues to play at a high level and recorded another shutout in his all-star season. The JV club also traveled to Anaheim taking on rivals from J Serra Catholic High School in what Coach Trevino called one of the most memorable performances of his career! After being down 4-2 in the third period, the Firebirds were forced to play without a goalie for the remainder of the game. The team showed tremendous grit, determination and discipline pinning their opponents into their defensive end. The Birds were able to score two goals to finish in a 4-4 tie. Strong performances from Cole Sheridan '21, Olin Silverman '22, Riley Frost '22 and Jake Esayian made the comeback possible.